Eisner-nominated cartoonist Kyle Starks (SEXCASTLE, Rick and Morty) will launch an all-new hobo-tastic action-comedy series, ROCK CANDY MOUNTAIN, this April. ROCK CANDY MOUNTAIN is full of high action, epic stakes, magic, friendships, trains, punching, kicking, joking, a ton of hobo nonsense, and the Literal Devil. Yeah. The Literal Devil. The world’s toughest hobo is searching through post-World War II America for the mythological Rock Candy Mountain, and he's going to have to fight his way to get there. Lots of hobo fights. So many hobo fights. 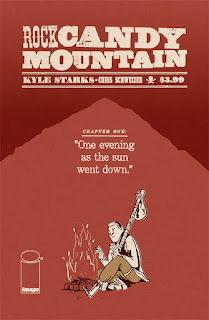 ROCK CANDY MOUNTAIN #1 hits comic book stores Wednesday, April 5th.